Eighty nine year old Harry Watson, who served as a radar operator on the Arctic Convoys during WWII, was presented today with the Artic Star medal by the Mayor of Brighton and Hove, Councillor Denise Cobb. The Arctic Star is a retrospective award, coming nearly seventy years after the end of World War II. It was announced in late 2012 and formally approved by the Queen this year. It is intended to recognize the service of personnel in the Arctic convoys of World War II. Mr Watson received his medal at a ceremony at St Andrews Primary School in Hove. The children listened attentively as he spoke of his experiences on the convoy. At the end of his talk he was rewarded with a call for ‘Three cheers for Harry the hero’. “I’m very proud but can’t help thinking about all those who didn’t make it.” said Harry. Having just read Forgotten Sacrifice by Michael Walling, I can only add my admiration of Harry and all the crews of the Artic convoys, many of whom never returned from the hardship and peril, whilst keeping Russia supplied with food, munitions and vehicles. 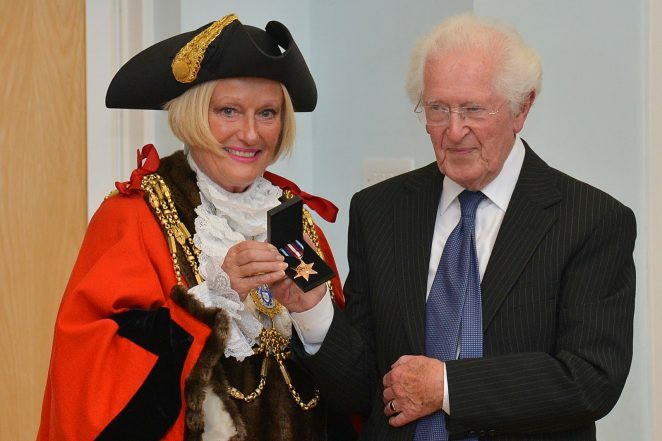 The U boats claimed many victims but thankfully Harry made it through to at last receive the long overdue medal. We will remember them! At least my generation will!